The reason for the influx is currently a mystery. But some scientists believe that pollution in the birds’ natural habitat might be one factor at play. 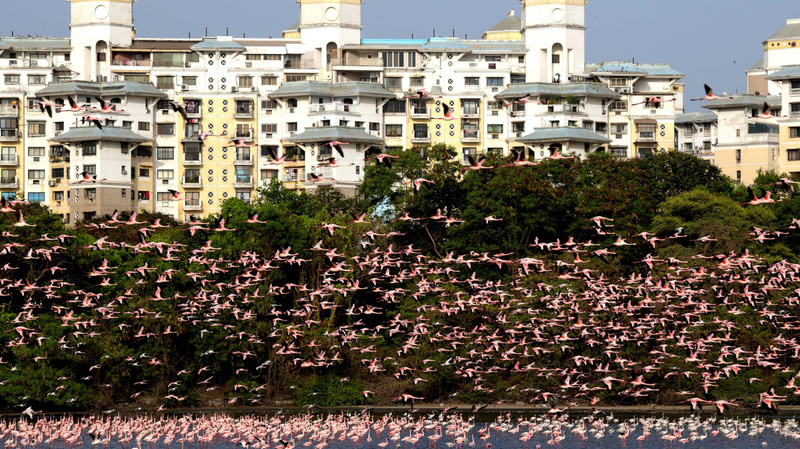 As The Guardian reports, one of the best places to see large flocks of flamingos in Mumbai is near a water treatment plant alongside the city’s Thane Creek. Now, an increase in sewage output and industrial runoff into the creek is thought by some to be fueling an uptick in the blue-green algae that the birds feed on. “The scene in the Thane Creek when they are wading in the water is amazing,” Rahul Khot, assistant director of the Bombay Natural History Society, says in an interview with NPR’s Weekend Edition Sunday. Khot and his team aren’t convinced quite yet that sewage output and industrial runoff is why the flamingo population has spiked this year, but they welcome the attention the flamingos of Mumbai are getting right now. “It’s really good to see large number of birds visiting this metrocity, but that also adds to our responsibility to conserve their habitat so that incoming future coming generation will also enjoy this bird,” Khot says. 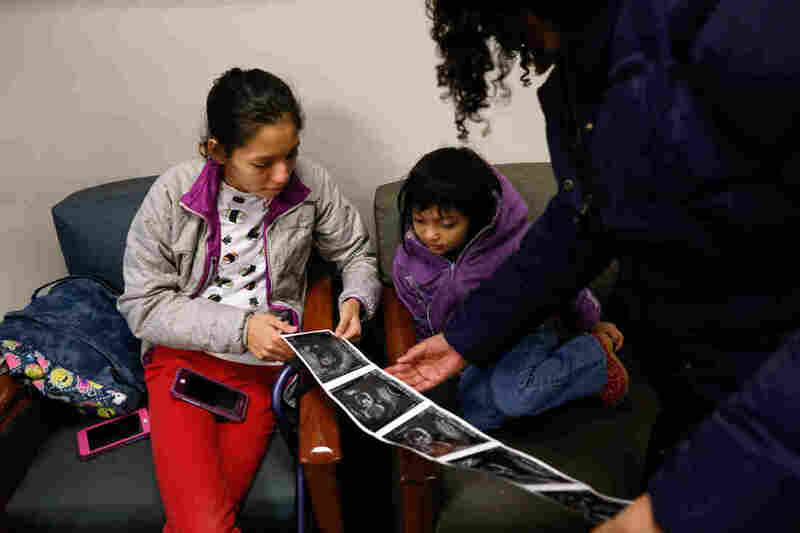 NPR’s Audrey Nguyen and Sarah Oliver produced and edited this story for broadcast. Zuzana Caputova, elected as Slovakia’s first female president, greets supporters on Saturday evening. Zuzana Caputova, a liberal environmental activist and a political newcomer, was elected Slovakia’s first female president Saturday, riding to victory on a wave of public outrage against corruption in government. With 58 percent of the vote, Caputova edged out European Commission Vice President Maros Sefcovic, a diplomat backed by the county’s governing Smer-Social Democracy party. Voters had been outspoken about their disgust with political corruption. After a journalist reporting on political corruption and his fiance were shot and killed last February, tens of thousands of Slovaks took to the street in protest, chanting “Enough with Smer.” The protests would eventually prompt the resignation of the country’s prime minister at the time, Robert Fico. Immediately after her victory, Caputova lit a candle at a memorial for the assassinated journalist, Ján Kuciak, and his fiancee, Martina Kusnírová. First Slovak female president Zuzana Čaputová lit the candle for murdered journalist #JanKucia and his fiancée Martina Kušnírová. It was first thing she did after elections. Caputova will be Slovakia’s fifth president since the country gained independence in 1993. As NPR’s Joanna Kakissis has reported, Slovakia’s presidential post is “largely ceremonial,” with the president wielding little day-t0-day power. But, Caputova has been outspoken about her desire to use the platform to promote transparency. She will take office in June. Three crowns are part of the Swedish national emblem and the Sweden men’s national ice hockey team is nicknamed “Tre Kronor,” meaning three crowns in the Swedish language. 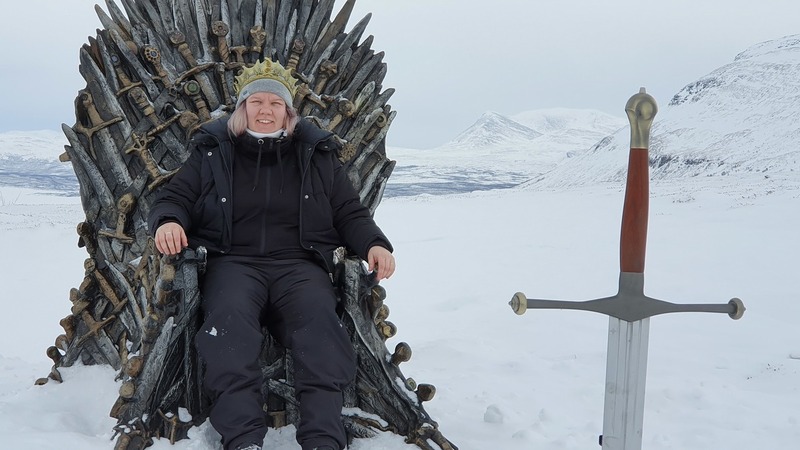 The man, dressed as a member of the famous Night Watch from Game of Thrones, said to the pair, “In the game of thrones you either win or you die, and today you have won.” He then put a crown on Wallenå’s head, crowning her queen of the North. 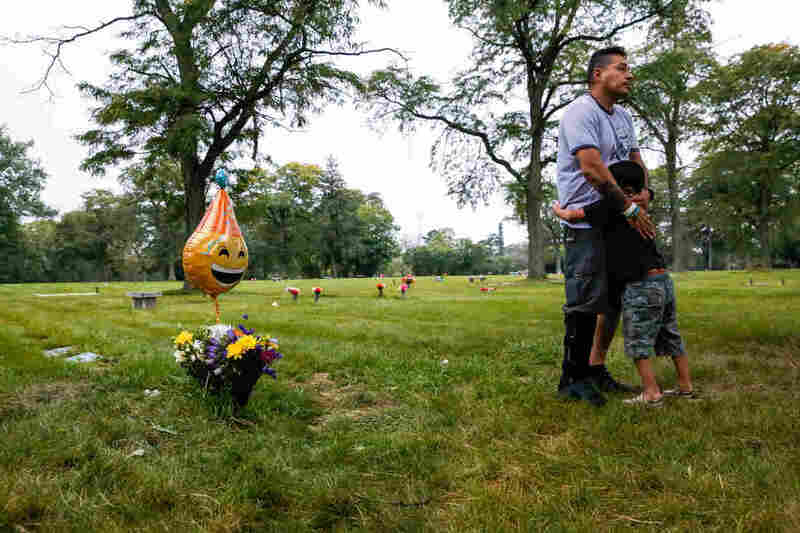 NPR’s Audrey Nguyen and Cathy Shaw produced and edited this story for broadcast. Bazawule spoke with NPR’s Michel Martin about the project. On making the transition from music to film. I had made music for six years by the time I made Afropolitan Dreams, and I was slowly getting to the point where I realized that trying to communicate this Africanness through music just wasn’t doing it. So I knew that I had to expand the palette. I’ve been a visual artist since I was a kid — I’ve made music, and I felt cinema was the logical next step. It allows us to combine all these things that we know, visual and sonic, and it puts people in the shoes of characters, so it makes sense as a medium. You can’t tell a story currently about Africa without shedding some light on the environment and how that’s become exploited, whether it’s through mining, lumbering or wherever the natural resource grab is. It’s also seeing China make a play on the continent, and some really strong European corporations still running things. So for me, it was very important that that was present. But I never once wanted to make a story that centered [on] that. The film is about two brothers who have a jagged past, and one brother goes missing. We kind of suspect his brother is responsible for it, but his daughter then has to go on this magical journey to find him when nobody else can — the police can’t, and his wife can’t. 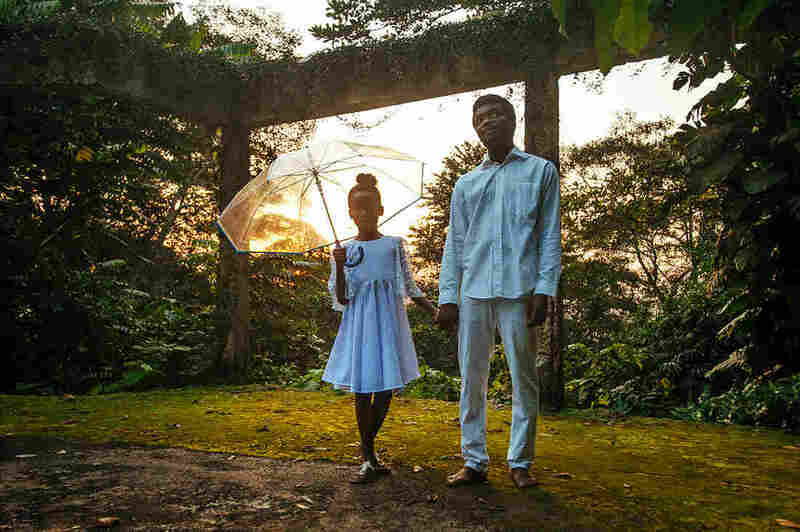 That was one of those moments I feel we haven’t seen much of in cinema in general — father-daughter relationships — but definitely in African cinema where it is tender, it’s heartfelt. Making this film I was very focused on nuclear relationships. I was focused on family and family relationships, family drama, family dynamics, loss, betrayal, love. Things that, again, aren’t often seen in African cinema. Story is all about autonomy — who gets to control the story and who gets to tell the story. I felt that many African films haven’t had the kind of autonomy that they should have. And you can tell by the choices that are made cinematically when it’s clear somebody was in the room that just didn’t really understand. So going into this film, autonomy was the first thing. If we’re going to make a film, then we should be adding to the canon of filmmaking, but specifically to the canon of African filmmaking. That required us to kind of put our heads together with other Africans to say, “What do you know? What do you remember?” And those memories are how I’m going to form the foundation of this film. For me, my storytelling genesis begins with my grandmother’s stories. You know, late-night nocturnal sitting around listening to fairy tales and folk tales and magical tales and stuff that only your mind could imagine. For me, making this film was central that I continued in that tradition. It was about mirroring what I know. Africa is so rich visually, from fabrics in the marketplace to what the clay looks like, to what the earth looks like. It’s so vivid. And it’s always struck me as odd when I watch movies from the continent that are often desaturated and almost sepia-toned. I’m always baffled because it’s clear that whoever’s coloring this has probably never been to the content, or definitely hasn’t walked through the marketplace, because when you do, you realize that color comes at you. For me, it’s the reason I’ve been making art from the beginning. I don’t think it’s right that a continent with over 1.2 billion people has such little visual representation, specifically in cinema. If you ask the average person how many African films they’ve seen, it’ll baffle you. The numbers are in the single digits. If you ask any African how many American films they’ve seen, that’s their entire life. So if we understand that cinema is a means of building empathy and for you to walk in shoes of people you’ve never met and to understand their circumstance, then you understand how important it is that our films don’t just play locally, but they play globally. Because within that global discourse, that’s how we form our ideas of each other. And if the films that are made from the continent aren’t made by Africans or controlled by Africans, then the narrative is always one that doesn’t really exemplify Africa. This story was edited for broadcast by Tinbete Ermyas. NPR’s Korva Coleman explores a recent controversy taking over the Internet: which is the best way to slice a bagel? 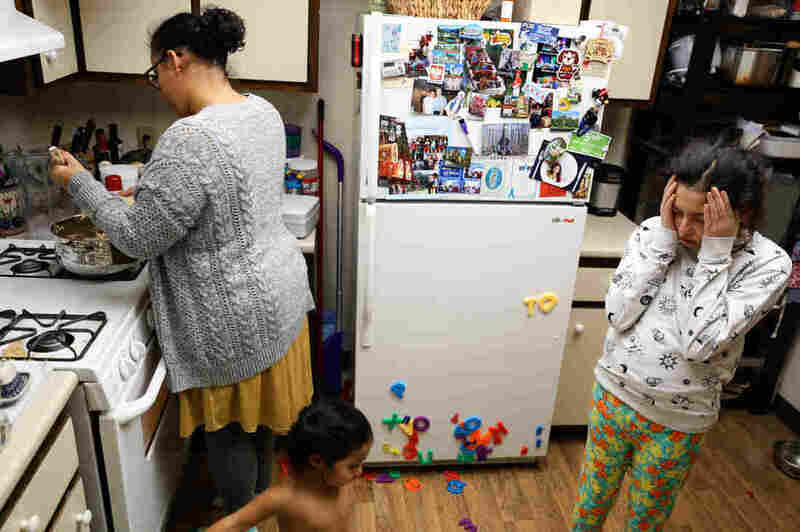 NPR’s Korva Coleman talks to Katherine Goldstein about her new podcast, which looks at the lives of working mothers and childcare issues. 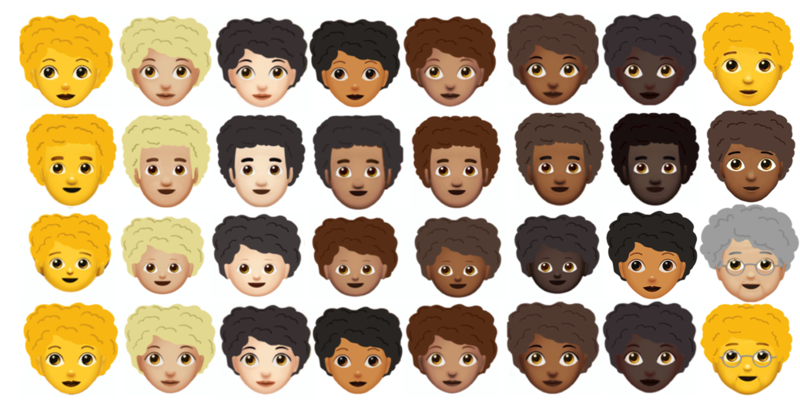 Kerrilyn Gibson designed prototypes for an Afro hair emoji. Lola Muñoz belts out the words to her favorite songs while she cleans her room on April 28, 2017. 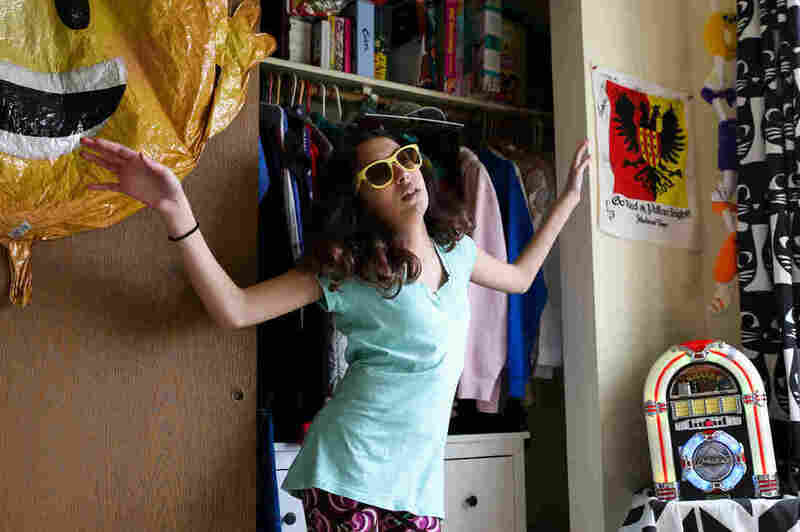 Photographer Moriah Ratner spent over a year and a half documenting Lola’s journey, first in New York and, later, in Chicago following a family move. 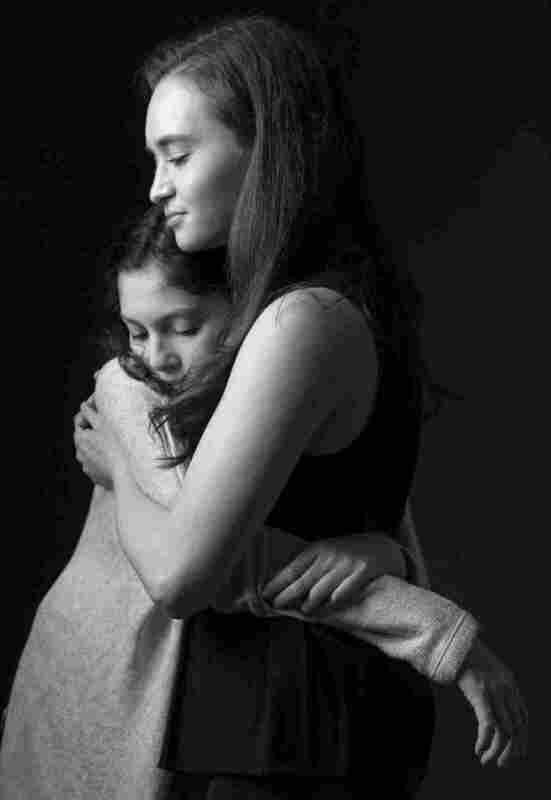 Lola and photographer Moriah Ratner share a quiet moment. The two considered each other close friends. Ratner says sometimes Lola would grow sad, knowing that “the only reason” she met Ratner was because of her sickness. As part of an assignment for my photography class at Syracuse University, I reached out to the Make-A-Wish Foundation of Central New York in the fall of 2016. They said they needed someone to photograph a “rush wish,” which meant the child was terminal. I met the Muñoz family at their home on Fort Drum in Jefferson County, New York (a 90-minute drive north of Syracuse). We connected by baking chocolate cupcakes and preparing for the annual Halloween fair at Lola’s school. Lola had just completed six weeks of radiation therapy. 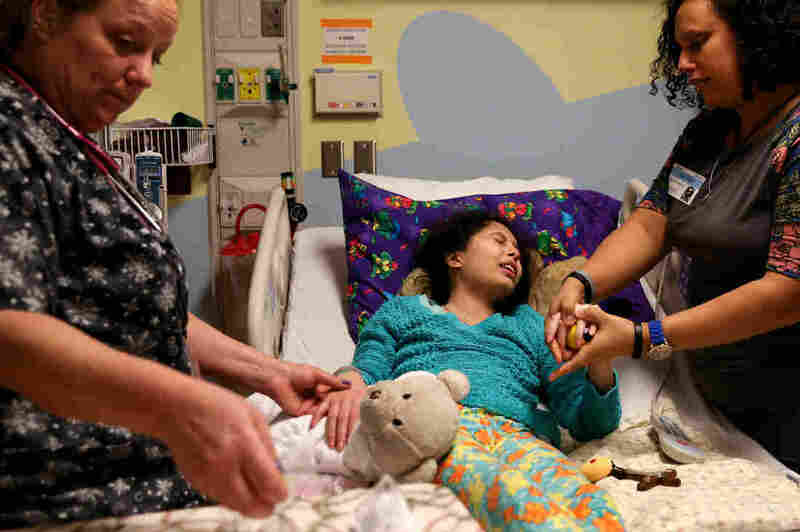 After being admitted to Upstate Golisano Children’s Hospital for severe dehydration, Lola asks her mother, Melissa, “Why is God punishing me?” She lists off her wrongdoings to her mother, apologizing for the mistakes she has made in the past. Though cooking is one of Lola’s favorite pastimes, Lola feels too exhausted and sick to stand for a few minutes. Lola prepares for 10 rounds of radiation by getting a mask made after becoming more symptomatic shortly after her diagnosis. 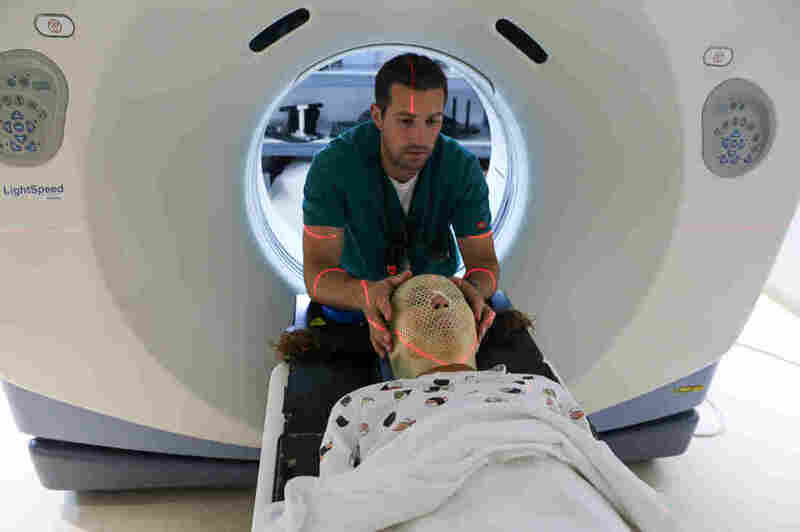 A rushed MRI in August revealed tumor progression. Lola’s radiologist urged Lola to begin her treatment as soon as possible, as her condition could worsen in just days. This project became my life. I usually spent four days a week with the Muñoz family. I would drive from Syracuse to Fort Drum — usually on Thursday or Friday — spend the weekend and head back to Syracuse on Monday. I’d even go to Mass with them on Sundays — and I’m Jewish. Melissa comforts Lola after she vomits from taking her chemo. Lola’s physical symptoms were extreme; the medical trial she entered was all about how much she could withstand. One evening in May, my friends invited me to dinner. There was a book laying on the couch called Lessons in Death and Life. I picked it up and immediately became overwhelmed with intense anxiety. I stepped outside and called Lola’s mom, who calmed me down. My friends went to a faculty member expressing concern about my mental health; the professor asked what would be left in my life after Lola was gone if everything I did revolved around her. 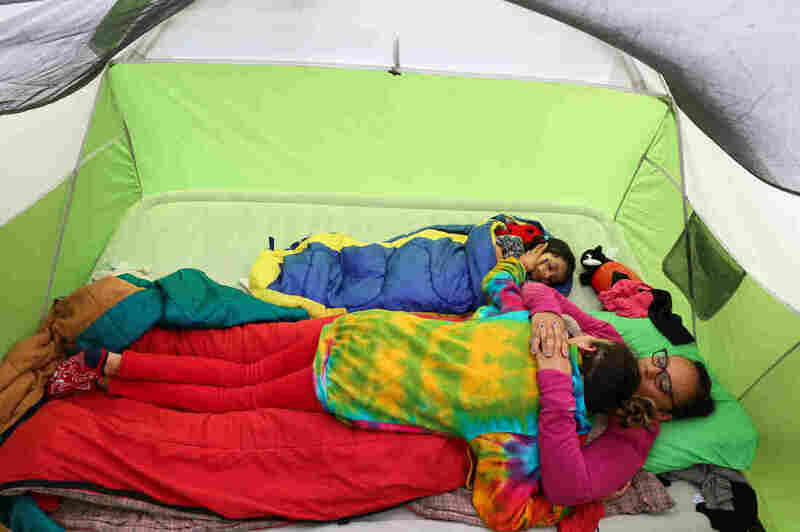 Melissa, Lola and Lola’s younger sister, Izel, enjoy down time together as heavy rains restrict the family’s plans while camping in Youngstown, N.Y.
Agustin, Lola’s father, teaches Lola how to float on her back at a hotel swimming pool on April 9, 2017. After four months of experimental chemo, Lola met her breaking point and ended the medical trial — a decision based on her quality of life. Revitalized, Lola gained the energy to enjoy her favorite activities again. A few days later, I went home and was able to spend time with my grandpa. He said, “You have a gift, and that gift is you. You don’t have to prove anything to anyone. The only person you have to prove is yourself. You have done beyond a mitzvah.” I told him how I didn’t feel like the same person as I was last year. He said that is called growth. I felt like I was never doing enough, and I was scared to lose the person I was when I was with Lola. The grief became all consuming. I had low energy and wasn’t sleeping well. I could physically be in a space, but my mind would be elsewhere. I had trouble remembering what day it was, to the point where I’d mix up deadlines. Even though my friends were trying their best to relate and support, I felt they couldn’t possibly understand, because they weren’t experiencing what I was, leaving me feeling very alone. After symptoms worsened, Lola’s oncologist scheduled a rushed MRI on Dec. 6, 2017. 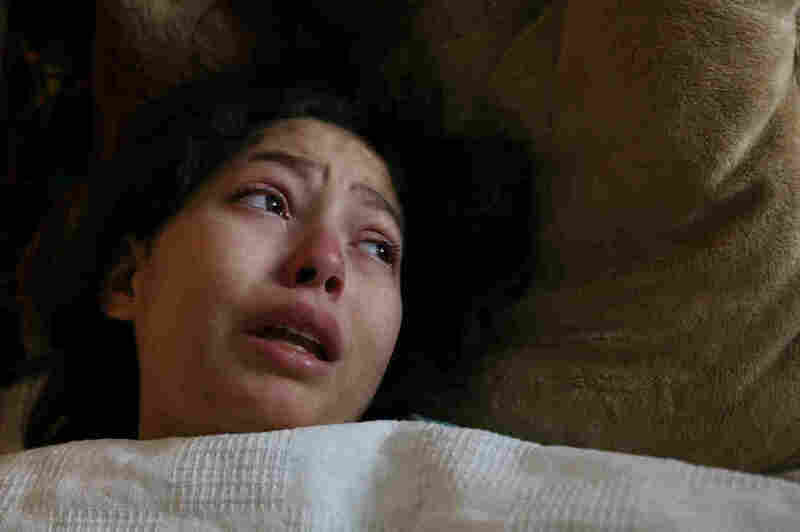 Lola speaks to her mother on the phone, expressing fear that her tumor has grown. Melissa, absent from the appointment because she felt unwell, attempts to calm Lola by listing off foods she will cook for Lola in the coming weeks. Melissa was pregnant with her fifth child and was due in April 2018. A successful ultrasound appointment on Dec. 1, 2017, revealed that Melissa, then five months pregnant, was expecting a girl. Lola (left) prayed to meet her new sister but said that if she didn’t meet her sister on Earth, then from heaven she would watch her sister grow. Lola becomes extremely exhausted after attempting to build a snowman on her own. The uncertainty of how much time Lola had left to live left the family on edge. Much was unknown about Lola’s brain tumor, diffuse intrinsic pontine glioma, including how slowly or quickly Lola’s symptoms could worsen. 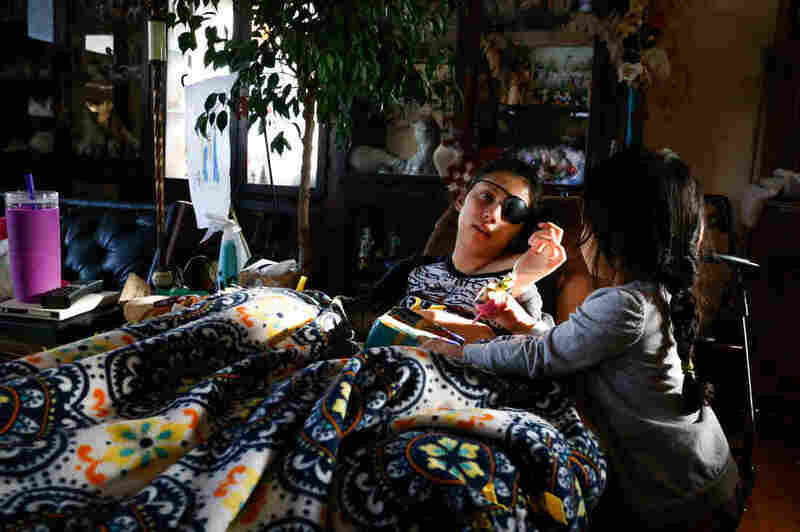 Her family cherished what days they had left to spend together and believed each day was precious. At a certain point, I knew I had to be present and stable or my work would suffer. I started journaling and found that a blank page was an open and honest space of release. I began biking an hour a day when the weather was good and indoor rock climbing when it wasn’t. I went to bed earlier, ate well and saw my therapist regularly. As the year progressed, I found the support system I needed to go on and maintain a healthier balance. Lola chose to be buried with her crucifix and rosary; both were always by her side throughout her illness. Another tough moment was not being there when Lola passed. I visited her in Chicago three days before her health made a sharp decline. My mom’s 60th birthday was April 1, so I surprised her and flew from Chicago to D.C. While boarding my flight back to Syracuse from D.C., Lola’s father texted me that she had worsened overnight. I wasn’t sure if I should fly to Chicago or go back to Syracuse to grab more equipment. I decided to get on the plane to Syracuse, then catch a flight to Chicago later that evening. When I landed in Syracuse, Lola had already passed. It has been a privilege and honor to tell Lola’s story. Our relationship has been a gift and taught me that nothing in the world is more valuable than time. I attribute much of my success and identity to her influence. Selma Bernadette Rose Muñoz was born one week after Lola’s funeral. Selma’s middle name honors Lola (Bernadette was Lola’s patron saint, and roses were Lola’s favorite flower). Ellis (right) helps Lola’s older brother, Soren, change Selma’s diaper. Agustin shares a moment with Selma. 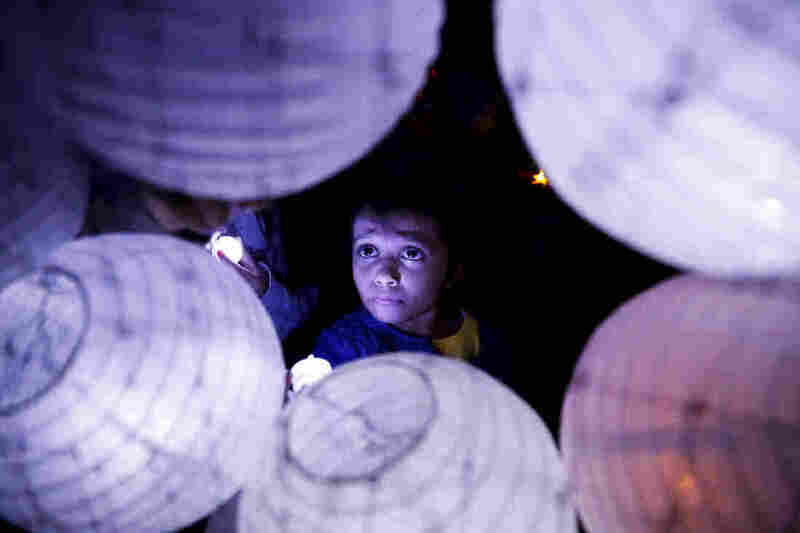 Izel places a light inside a lantern in remembrance of Lola’s passing. During the Pediatric Brain Tumor Foundation’s Starry Night 5K in Chicago, hundreds of lanterns were lit in the night sky to symbolize hope for a cure and honor children in the fight against brain tumors. A few days before the protest, the two parties looked to be on the brink of a new wave of major fighting. On Monday, rocket fire from Gaza hit an Israeli home, injuring seven. The next day, Israel’s military retaliated with a series of airstrikes. But with both parties in the midst of negotiating a truce, the protests were more peaceful than in the past. In a statement, Israeli prime minister Benjamin Netanyahu called the day of demonstrations “calm,” and the Hamas militant group that rules Gaza did not vow revenge for the deaths of the four protesters. This past week, Egyptian mediators have been on the ground in both Israel and Gaza, hammering out a ceasefire that would involve Hamas reducing its violence in exchange for Israel relaxing its stronghold on Gaza’s economy. And despite some minor violence Sunday morning, with rockets fired from the Gaza strip into an open area in the south of Israel, Hamas claims it’s close to reaching a deal. 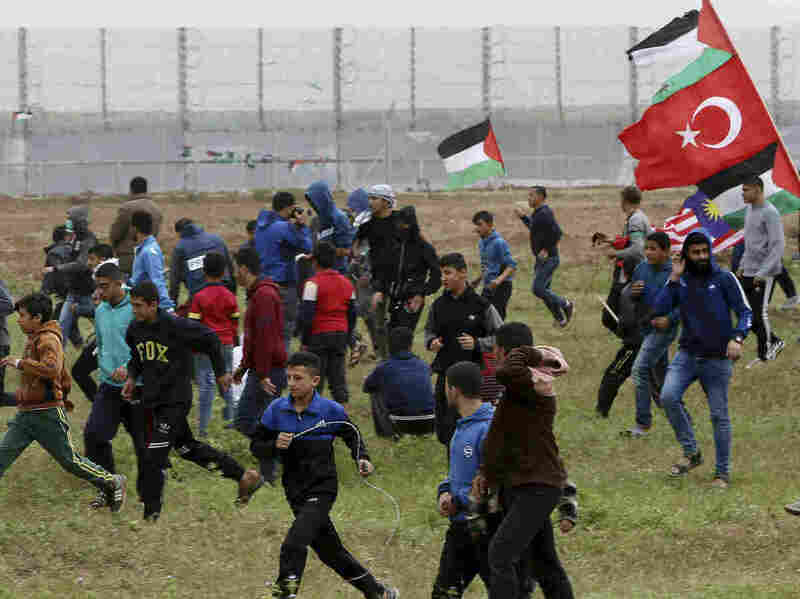 The “Great March of Return” protests have been organized every week since the fatal march, an attempt to end Israel’s years-long blockade of Gaza and bring attention to Palestinians “right of return” to the homes lost when the state of Israel was created in 1948.